All clinics are scheduled with track operator. Each clinic will be posted on the track schedule. The purpose of this policy is to ensure the efficient and equitable use of the DESOTO BMX facility, to ensure a safe and enjoyable environment for its participants, and to assist in meeting the organization’s financial obligations and protecting its physical assets by establishing policies, procedures, and fees for BMX clinics. 2.1 All clinics shall be scheduled with the Race Director. There will be no exceptions to this policy. Race Director makes all final decisions in regards to the schedule for clinics. Scheduled with the Race Director on a weekly and/or monthly basis depending on the race schedule. 2.3 The length of time for a clinic shall not exceed three hours. 2.4 All one day or multiple day clinics must be scheduled at least one (1) month in advance, and must be approved by the Race Director. One day or multiple day clinics will have exclusive use of the track. A “day” is defined as being from 9:00 AM until 5:00 PM. 2.5 The Race Director may allow for minor changes in clinic scheduling to accommodate either Desoto BMX or the participating clinic. 2.6 The Clinic schedule will be updated weekly and maintained on the Desoto BMX website. 3.1 The USA BMX sanction fee will be paid by the coach, $20 per clinic/per day and a fee of seven dollars ($7) per clinic participant shall be paid to the track. The Race Director and/or designated track volunteer will collect all fees. Payable at the beginning of the clinic. 3.2 For one day or multiple day clinics, the seven dollar ($7) fee per clinic participant per day will be based on a minimum of 30 riders or $150.00 per day. If rider count is more than 30 a fee of $7.00 is accessed per rider over 30. The minimum is $150.00. 3.3 If a scheduled clinic is on a Race day for Desoto BMX, the sign up fee for the night’s race will be collected as part of the clinic fee, $12 for Friday racing and $15 for Saturday Racing. The amount over the sign up fee will be given to the clinic coach. 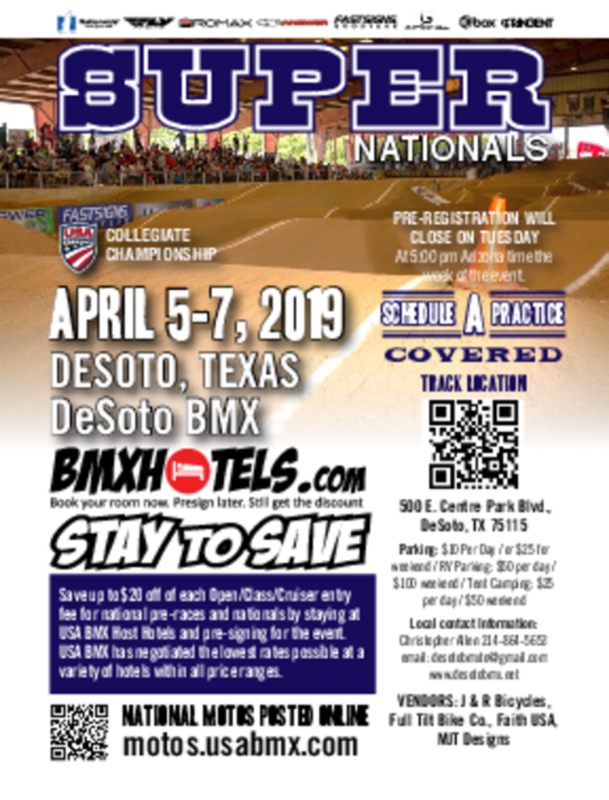 4.1 All instructors and clinic participants must hold an USA BMX membership and be in good standing with the USA BMX and Desoto BMX. 4.2 Before the start of the clinic, a clinic sign-in form must be filled out and turned into the Race Director and/or Track Volunteer along with all fees. The sign-in form will include the participant’s name. 4.3 A dated Balance Sheet will be completed at the end of each clinic to track fees and the number of participants . 4.5 The clinic coach will sign the receipt each time acknowledging his or her receipt of the money owed to them. 4.6 No more than one clinic will be allowed on the track at one time. 4.7 Riders, including the instructors, must wear all required safety equipment and follow all USA BMX rules and track rules. 4.8 It is the instructor’s responsibility to make sure these rules are enforced. Failure to enforce all rules will result in the loss of clinic privileges. Coaches License. The coaches license must be valid and up to date. 4.2 Each Coach must pass a Background Check provided by the City of Desoto at no cost to Desoto BMX or the Coach prior to holding a clinic. 4.3 Each coach must abide by and sign a Desoto BMX Code of Conduct prior to getting on the track or holding a clinic. In the event a clinic participant is injured, the injury shall be reported to the Race Director and a USA BMX injury report filed. 6.0 Instructors Rights and Expectations of Desoto BMX: The instructors are conducting clinics as a business. It is a part of their income. They are paying for the right to use the Desoto BMX facility. They should have certain expectations as to what they receive for the fees. It is the responsibility of Desoto BMX to provide a facility that meets their needs. 1.0 Facility and gates open on time. 1.1 Desoto BMX will provide properly operating starting gate and control system. Timing device on request. 1.2 Track is to be in race condition. 1.4 Snack bar is not required to be open during clinic times. 1.5 Clinics may provide food, snacks and drinks during clinic hours to clinic participants. 7.0 Desoto BMX expectations: It is imperative that Desoto BMX protect their facility and equipment. It is noted that they have expectations of the instructors and all participants to have the same concerns. 1.0 Care and security of the starting gate controls and timing device. 2.0 Instructors are responsible for the actions of all participants. They are expected to discipline and rider being abusive to the facility. 3.0 Instructors are responsible for their conduct. Any violations will be dealt with by the Race Director. His decisions are final. 4.0 Trash and litter by clinic participants will be policed by the instructor(s) at the end of the clinic. 5.0 All instructors and participants should be respectful of the Desoto BMX facility. 8.0 Instructor Approval: Instructors should meet with the Race director to receive approval to hold clinics. 1.0 Instructors should be prepared to critique the type of clinic and the goals of the clinic. As with all approval systems there must be a disapproval or termination system in place. If the terms and conditions of this agreement are violated by an instructor the consequences should not be a surprise. 1.0 There must be good cause for termination or suspension of an Instructors rights to hold clinics. 4.0 Any physical contact will result in permanent suspension of Desoto BMX privileges. A police report will be filed with the Desoto, Texas Police Department. A report will also be filed with the USA BMX. The USA BMX will determine their action. The ruling of Desoto BMX is not subject to change or overruling by USA BMX. 5.0 Failure to report all participants and make proper payment is grounds for suspension. 6.0 Any free clinic times given away by the instructor are at his expense. The $7.00 track fee is still applicable. The sanction fee of $20 is still charged. agree with the policies and conditions of Desoto BMX. meeting of thy minds and all parties. Decisions of the Race Director and the Board of Directors is final.